The UK poetry scene is a really supportive one, from what I’ve seen. Yesterday was a brilliant example of this, with poets *everywhere* from the Clore Ballroom to BBC Radio, to Channel 4 taking over for a day. Maybe this is the Christmas of the poetry world? Seems like it. It was also nice because myself and five other brilliant poets curated the whole event as Young Producers. That’s the title given to us by our coordinators from The Poetry Society and the Southbank Centre. It was a real joy working alongside this team, including sister poet Belinda Zhawi – now a London Laureate (big up!) – programming a range of brilliant poets including the recently Forward nominated Karen-McCarthy Woolf, Patience Agbabi, Malika Booker, Liz Berry, whose voice is as soothing as silk. Robert Montgomery, poet and artist, was also there – in installation as well as human form. He gave an insightful talk about his poetic and artistic processes. Serendipity had a large part to play in this. 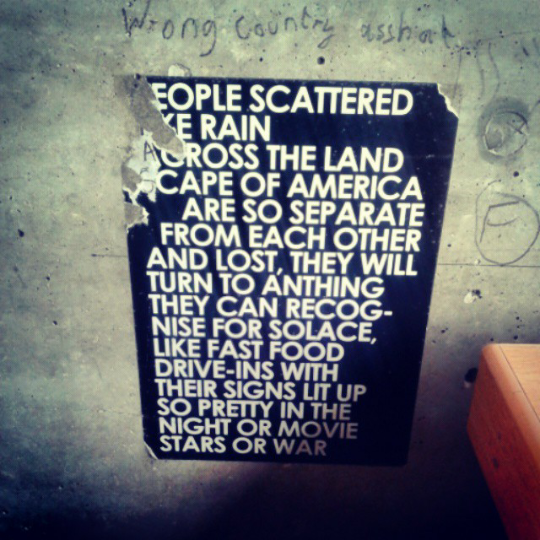 In a nutshell, I was working procrastinating in the UEA Library this summer and to my left was a sticker of one of his poems. Naturally, as is done these days, I Instagrammed it. Excuse the graffiti. It wasn’t me. And within hours, his team gets in contact and within weeks we have arranged for the installation pictured above to be at the Southbank, with the artist present. Sometimes social media has its perks, right? According to Montgomery, he doesn’t even make stickers. I guess this is what you call making your work work for you. I’m taking note. Anyway. Happy belated Poetry Day.